Knowledge will forever govern ignorance, and a people who mean to be their own governors, must arm themselves with the power knowledge gives. A popular government without popular information or the means of acquiring it, is but a prologue to a farce or a tragedy or perhaps both. What can be done to improve the human right of access to public documents, transparency and fight against corruption in Germany? thank you very much for your information dated 13 February 2006 that the petition "Access to information" in Germany  has been transmitted to the competent Committee of the Parliamentary Assembly . However I can not see to have received a decision on admission. The human right of access to public documents (International Covenant on Civil and Political Rights, European Covention of Human Rights) is recognized as precondition for democracy and essential in the fight against corruption. Now many countries outside Europe are more advanced then Germany looking at freedom of information, transparency and fight of corruption. 84 states with approx. 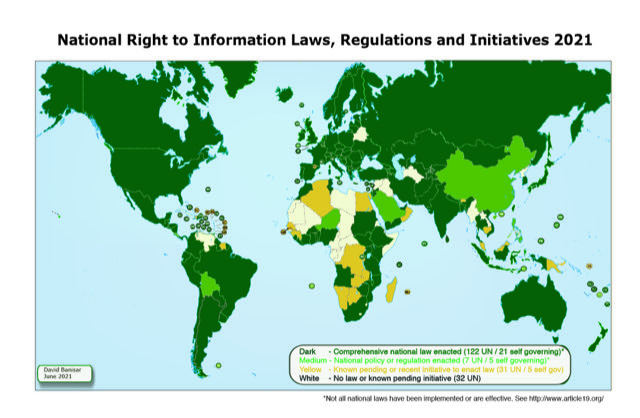 5.5 billion inhabitants give better access to information then the federal Freedom of Information Law in Germany (http://www.rti-rating.org/country-data/). More then 115 states (http://right2info.org/laws) with more then 5.9 billion inhabitants adopted FOI laws or provisions in constitutions. 5 German states with half of the population lack FOI laws. 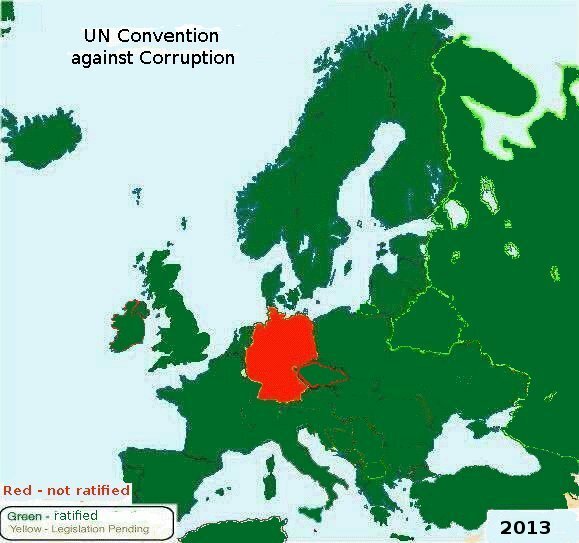 The UN Convention against Corruption is ratified by 158 states with more then 6,5 billion inhabitants, but not by Germany (Appendix A). Germany did not ratify the Criminal Law Convention on Corruption and does not follow Recommendation Rec(2003)4 on common rules against corruption in the funding of political parties and electoral campaigns of the Council of Europe as GRECO (Group of States against Corruption) suggested 4. December 2009 (Appendix B, Appendix C). GRECO concludes 29. December 2011 in report Greco RC-III (2011) 9E that Germany has implemented or satisfactorily dealt with only four of the twenty recommendations contained in the Third Round Evaluation Report (Appendix 3). Germany has to report on progress 30. June 2012 at the latest. But nothing happened up to now. Germany has to improve the federal FOI law, adopt FOI laws in 5 federal states (Bundesländer), ratify CoE and UN conventions against corruption and improve transparency of sideline jobs for members of parliaments and funding of political parties to catch up with other states in Baltic Sea, Europe, America, OSCE, OECD and WTO (see weakness no. 2, 3, 4, 8, 34, 35 and 52 of National Integrity Report by Transparency Germany). "Parlamentwatch" offers a possibility to ask questions to members of parliament. Unfortunately only a minority of the political parties in the federal parliament and federal states were willing to strengthen transparency and anti-corruption (Appendix O). Germany is the only country ignoring the demand of the first Baltic Sea NGO Forum to adopt the human right of access to public documents (Appendix N). I ask the competent Committee of the Parliamentary Assembly to help Germany to catch up with the other European states. 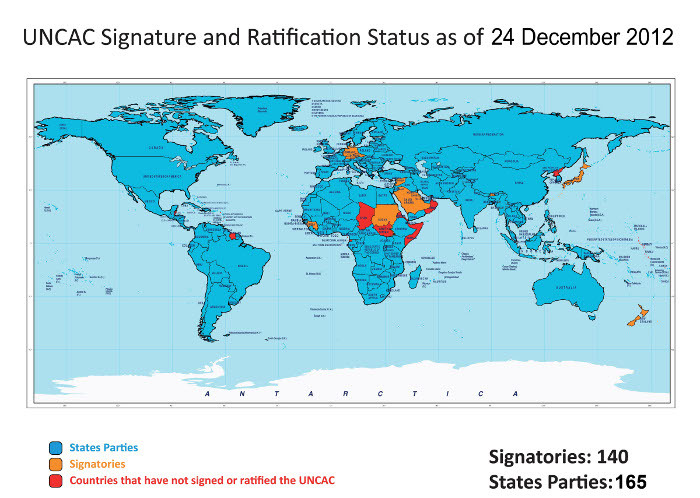 http://en.wikipedia.org/wiki/UNCAC: 159 states have ratified United Nations Convention against Corruption (UNCAC). Germany has not ratified.